NBA DAILY DRIBBLE: Are the Lakers finally rolling? Don’t look now, but the Lakers have won three of their last four games. Their only loss in that stretch came from the league-leading Toronto Raptors (more about them later). The Lakers are one of the most entertaining teams in the league. They continue to produce highlights on a regular basis with a rotating cast of young, up and coming players. It also doesn’t hurt that they have LeBron James, one of the most electrifying players in the world. Almost all of their games, win or lose, have been nail-biters. The game against the Timberwolves was no different. 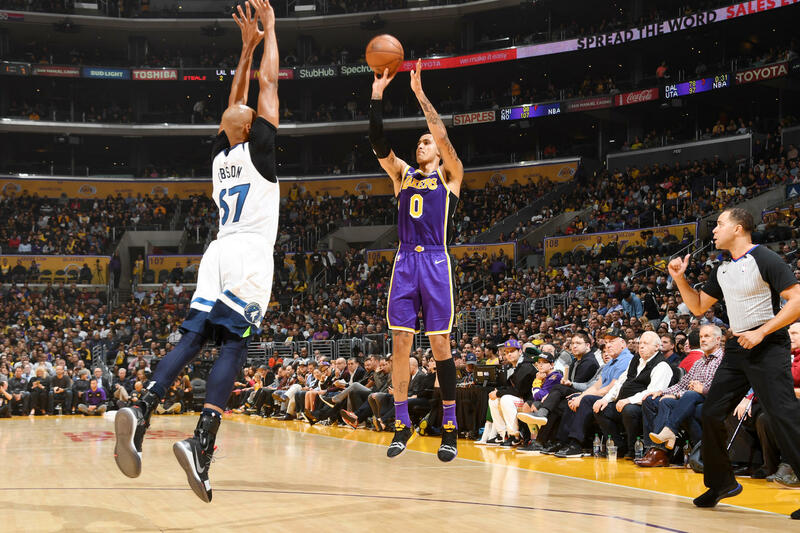 Kyle Kuzma hit a three-pointer to give the Lakers a seven-point lead with less than two minutes left in the game. In true Laker fashion, they allowed their opponents to get back in the game. Derrick Rose nailed back-to-back three-pointers to cut the lead down to one. Thankfully for the Lakers, their newest signee, Tyson Chandler made some big plays in the end. The newest Laker big grabbed two offensive rebounds to save missed shots by his teammates. That led to a Kuzma free throw to extend the lead up to two. Minnesota tried to set up Rose for the go-ahead three-pointer but Chandler contested Rose’s shot forcing a miss to save the game. Four players scored 20 or more points in the game today, highlighting the balance of this Laker team. LeBron James narrowly missed a triple-double with 24 points, 10 rebounds and nine assists. Kuzma and Josh Hart scored 21 points each while Brandon Ingram had 20 points, five rebounds and six assists. The Lakers schedule gets easier in the next 10 games with several lottery teams and home games on tap. With Chandler on board and everyone slowly figuring things out, they can really build momentum after an inconsistent start to the season. After missing two games due to an ankle injury, Donovan Mitchell showed that he’s back to 100%. He was flying all over the place in his first game back. He looked like he was floating on some of his dunks in the game against the Mavs. This win breaks a four-game losing run by the Jazz, considered one of the best teams in the West. With Mitchell back, they can finally get on track and rise up the standings like they’re supposed to. Early in the season, the Raptors have announced that they’re fighting for the crown in the East. The throne abdicated by King James, was automatically awarded to the Boston Celtics before the season began. But the Raptors have shown that they’re equally worthy, if not more, to wear the crown. Their latest win though, puts them at 11-1, making them the best team in the league, record-wise. Their game against the rising Sacramento Kings was another showcase of their depth. Kawhi Leonard returned after missing a couple of games to rest a sore foot. He scored a game-high 25 points and played his usual brand of terrific defense. But he was’t alone. Serge Ibaka had a 14-14 double-double. Kyle Lowry had 16 points and eight assists. Pascal Siakam continues his growth with 21 points. The Warriors have undoubtedly the best team in terms of sheer number of All-Stars. But the Raptors go deeper and have unlocked several players under Coach Nick Nurse. Maybe Toronto isn’t just contending for the best team in the East. Maybe they’re looking to be the best team in the NBA. The last seven games before this match-up against the Bulls has been a tough stretch for Davis. he had to sit out three games due to injuries. In the four games that he did play, he didn’t look right. He only averaged 18 points and 10 rebounds on 35% shooting. Way below what everyone is used to. The Pelicans suffered during that drop, losing six straight games. Against the Bulls, Davis was back to his MVP ways. He had 32 points, 17 rebounds, seven assists four blocks and a steal, shooting 54%. It’s no surprise that the Pellies won this game. Davis’ MVP contention goes beyond sheer numbers. When he plays well, the Pelicans look unstoppable. When he’s not right, things aren’t right as well for New Orleans. Today was one of those days where big men had dominant games. Hassan Whiteside toyed around with a triple-double. He had monster numbers of 29 points, 20 rebounds and nine blocks in Miami’s win over San Antonio. Andre Drummond also brought the numbers. He had 23 points, 19 rebounds and three steals in Detroit’s win over Orlando. This was a reminder to everyone that size still matters in a shrinking league.